AE Technology Group offers New York City businesses like yours a team of network support and computer repair service specialists to keep your business running smoothly and efficiently. Our skilled IT engineers and business IT support staff work with you to proactively prevent issues. We are always on call to diagnose any computer or network problem to ensure that it stays up and runs smooth. Our technicians are available 24 hours a day, 7 days a week, 365 days a year. Many NY businesses have an in-house technician, but we know from experience that sometimes it’s just not enough for just one person to do it all. Support for all the computers, hardware, networks, and infrastructure required for running a business in today’s ever-changing technology can be difficult. 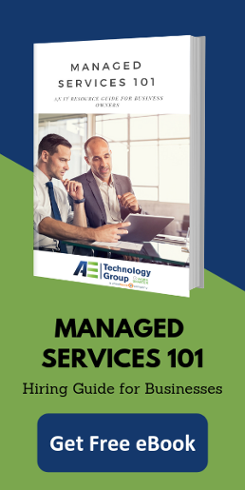 Click here to download the PDF on Managed Services.